Message 682 - Posted: 2 Feb 2019, 18:41:56 UTC - in response to Message 681. Very difficult to get GPU WU's. Message 685 - Posted: 2 Feb 2019, 20:16:41 UTC - in response to Message 682. The fraction of GPU WUs among all WUs didn't changed since the last run. What about the maximum amount of allowed GPU WUs a computer is allowed to have In Progress at once? Has that changed? It's like I can only have 25 WUs In Progress at a time an each PC I have. It's never been like that. Message 688 - Posted: 3 Feb 2019, 10:55:24 UTC - in response to Message 686. Yes, it’s 25 per host since September. It was 25 per GPU before that but I had to switch to per host limit because some hosts reported that they had 5 or more GPUs installed to get more WUs. With the per host limit, the WUs are distributed more evenly among the hosts. Message 689 - Posted: 3 Feb 2019, 18:52:37 UTC - in response to Message 688. Well, some of us do have 5 GPUs per host or more. Old mining rigs that I've acquired to crunch GPU projects instead of crappy mining are used. So 25 per GPU was nice. Message 691 - Posted: 3 Feb 2019, 19:27:40 UTC - in response to Message 689. Of course, setting per GPU limit would not be a problem if the total number of WUs was not so limited. Message 692 - Posted: 3 Feb 2019, 21:13:50 UTC - in response to Message 691. Yeah, those are evidently fake and gaming the system. I see your predicament with limited WUs. Thanks for the info. Message 695 - Posted: 9 Feb 2019, 20:48:44 UTC - in response to Message 692. But I also fully defend Vlad. Not forget Xanson have very few WU to crunch. It is known from the start of the project. The limitations give everyone a possibility to crunch. Very few, I agree. But it is the same for everyone around the world. Yes, midrange host, can crunch all WU in only two days. Before you accuse Vlad to fake and gaming, I suggest you read again the rules of this project ! Imagine instead of my weak hosts, I come with tenth of 64cores, all with 4x108Ti or better, All wu will be returned in a few minuts. And nothing for other. OK so far. For the project it is better. Scientist are happy to receive results. It is the main goal. But it is not the phylosophy of this project. Vlad, try to give everyone a chance to crunch. Always very few by user/host. I fully understand, agree and support his way of thinking. Everyone the same. I personnally very like this project. I am also like you frustrated to not receive more than 25 WU. But it are the rules. And Project admin have very clear explain why. Personnaly I crunched 3797 COD for only 1,042,915CR (situation time the same) ! So please do not do not accuse admin (vlad) about "fake" or "gaming". Personnaly, (but it is only me), I think he try to do his best for everyone. Scientist are happy. The main goal. Ranking .... is not important. Only for some who give more interest to ranking than to research. Message 696 - Posted: 16 Feb 2019, 17:26:44 UTC - in response to Message 691. 50 GPU on the same host ! And tyhis host is managed by a i7-2600K !?!? The same as 3 from my hosts. And this host have onlmy 8Gb RAM (also like me)The only possible is to run on several virtual machine. But with only 8Gb RAM I am not sure to be able to run more than 4 VM together. I want so mainboard able to manage 50 GPU !!! And eventually the speed of the FSB (not "russian secret service" his new name of course) Smile. I really would known the manufacturer and model of this mainboard able to manage 50 GPU. As far as I know, the maximum is four GPU SLI or Crossfire. If it is a server, OK, but then 2600K can NOT manage and Win10 also not. Yeah, those are evidently fake and gaming the system. A system with 50 logical AMD RX series GPUs is of course nonsense. But if you spot a host with many big Nvidia GPUs, then a likely explanation for this is that its owner is also SETI@home participant and configured this pseudo number of GPUs in order to bridge SETI's weekly maintenance window. The people who do this don't want to "game the system", they merely want highest possible uptime of their compute clients. This directly benefits the SETI@home project, and I applaud these users for their dedication and ability. Anyway; in case of XANSONS for COD with its low number of tasks per month, I can understand Vlad's choice for a simple per-host limit, instead of anything more complicated. Bluestang disapproved of the user with the abnormal host config, not of Vlad's countermeasure against hosts like this. Message 701 - Posted: 16 Feb 2019, 19:54:36 UTC - in response to Message 700. I see (read) I am not the only who agree with Vlad his way of doing. Then you comparaison with SETI. I am from past century on SETI. Everyone know the weekly outage. If I good remember in the latest 20 years on SETI, there were two main outage period. (I not count just after Arecibo "crash". You applaude for such invest. OK if it is honnest. So why to artificial mount 50 GPU. Like you say : nonsense. It is abusing the system. Look on SETI : host 8480062 !!! Great : on one host 48 (fourty-eight) GTX1080Ti !!! And running on a i7-6850K !!! I not write. It is not the place. Message 702 - Posted: 16 Feb 2019, 19:55:07 UTC - in response to Message 700. 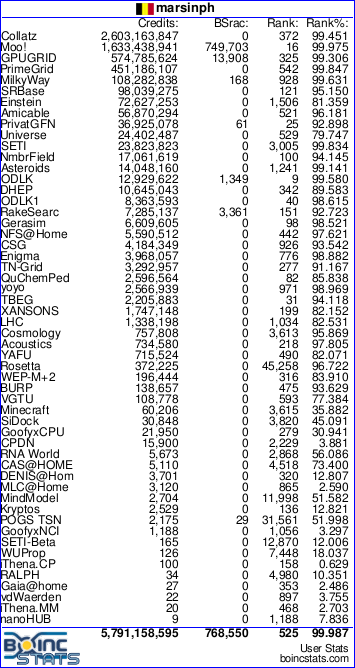 Sorry for straying off-topic, but: SETI@home has a quota of 100 tasks in progress per GPU. This is far less than what a good mainstream GPU can complete during a typical S@h maintenance downtime. This "fake" user who is "abusing the system" has completed almost 10 million points. Bravo to this guy for such dedication. If the program allow you to do it its not cheating / gaming or anything like that. If this shouldn't be allowed then the project software itself shouldn't allow it. But really this / these users are getting tons of work done so good on them as far as i'm concerned.